written by Elena from Austria. Such was the demonstration of “brewing tea” this afternoon as part of the 2008 WWOOF Festival hosted by Honey Anderson at her wonderful property in Dunsandel, 40 minutes south of Christchurch. Rather than “organic compost tea”, however, woofers and hosts went in favour of the delicious international lunch arrangements and Nicola Gallaway’s fantastic Slow Food creations, all of which were brought together as part of a truly unique day on the celebration and sharing of organic principles. So what was this year’s festival all about? Arriving at Honey’s place, we were first given a chance to introduce ourselves and the countries we were from, including a quick run-down on our previous woofing experiences and future expectations. However, as nationalities don’t usually dictate the way you pull up weeds or dig up the garden, our first task saw us quickly back on the same level again, lending a helping hand in Honey’s garden over a merry collection of green and brown cuts in order to prepare a compost pile! The animal poo, by the way, was already provided for this… smelly business! Hosted by Jim the “Dirt Doctor”, we thus learned how to prepare a yummy little compost “sandwich”, all of which was created and stacked up by the weeds and branches we had just collected off the garden beds and hedges. Heat and moisture are important elements to this, as is the right smell (yes, a compost can and should actually smell good in order to have beneficial effects on your soil!). We then went on with another one of Jim’s demonstrations on how to dig up garden beds for planting vegetables before sharing deliciously prepared potluck lunch and discussing what we had just learned on top of our previous experiences. Networking and common enthusiasm for organics provided a really nice atmosphere in which discussions between woofers and hosts could thrive and many an interesting experience shared. After lunch, we enjoyed two presentations given by Jim on organic farming research and Holger Kahl from the OANZ (Organic Aotearoa New Zealand). The main message across both discussions tied in with a recent proposal made by WWOOF regarding the establishment of a so-called Edu-Wwoof programme. The idea is to bring together hosts and woofers with a specific interest in learning / teaching organic principles, as opposed to “simply having a few days holiday on a farm”. Lively brainstorming and discussion filled the late afternoon / evening before Nicola Gallaway went on stage demonstrating her skill and passion for “Slow Food”, seasonal cooking and organic ingredients. Probably the most important understanding we took from her was that “slow food” was neither boring nor taking up ages to prepare – on the contrary, it is about YOU taking time to savour the ingredients, thinking about their origins and the love that went into their preparation … Bon Appétit! The delicious meals spread throughout the day had woofers and hosts alike slowly winding up over the evening, finishing in another presentation by Jim before the festival finally came to an end. All in all, this day was a perfect networking opportunity, included many a good anecdote on sustainable and organic farming / growing and the possibility to forge new contacts and develop our personal networks. Having only become a recent member of WWOOF in New Zealand, I must say that this day has really got me enthusiastic about sharing my skills and learning about organics as I continue travelling. I certainly look forward to a lot more happy and stimulating experiences like these! And once again, it was demonstrated: If a group of young people come together and get passionate about a certain subject, NOTHING IS IMPOSSIBLE! Feel free to ask Honey about this or drop by and have a look at her garden…and the beauty and passion that went into piling up and stomping on her compost ground. See you out there. Happy WOOFing ? ! Elena has recently finished studying sustainable & cultural tourism management and has always had a passion for naturally grown food according to the principles of organic farming. Her skills and eagerness to travel Aotearoa New Zealand have led her to first support Creative Tourism New Zealand (www.creativetourism.co.nz) before signing up with the WOOF-Organisation in May 2008. She is looking forward to making the most out of the exchange offered in terms of intercultural awareness, sustainable lifestyle methods and New Zealand’s proven expertise in the field. 14 May 2008 at 2:16 pm. Thanks to everyone for coming and sharing in the event. It was great to have people from Germany, Austria, Spain, France, UK, Switzerland, Canada, USA, Australia and NZ coming together to help, learn and share together. 16 May 2008 at 8:08 pm. This was a really amazing event!!! Thank you everyone who helped make it happen. The whole day was wonderfully full of learning and sharing ideas with interesting people while eating delicious food. Meeting and talking with people who have similar life goals and ideals always lifts my spirits. I look forward to the next conference!!! 19 May 2008 at 3:39 pm. Thank you so much to the host(s) and everyone, really, for a great time! I was excited to be a part of such an educational experience, as well as meeting such good people (and eating yummy food)!! I hope you have more events like this in the future! 20 May 2008 at 11:56 am. I’d also like to add my thanks to everyone who contributed to the day – your hard work and enthusiasm was much appreciated. I think the format of some practical demonstration outside and some presentations inside worked well. I also liked the way the discussion about growing food was followed up with appreciation of good food on the plate. There was plenty of opportunity for asking questions and for general discussion and chat amongst the participants. for me a single day was plenty of time and I wouldn’t have wanted music or dance. Such an event might be good in addition to the single day/no dancing version, but not as a substitute. The only point I would make about the current arrangement was it was quite dependent on having reasonable weather so people could be outside. It worked really well, but that was lucky given the rain the previous day! 22 May 2008 at 7:59 am. It was a privilege to be able to host the Festival. Thanks you to all the wwoofers who made the effort to come and make the day possible. The help with gardening was appreciated and participants may like to know that there are now 3 large compost heaps working away, getting ready for my spring planting! Especial thanks to Sarah and Edouard who stayed and helped afterwards. 23 May 2008 at 12:11 pm. Great day by the look of it. Lets have one in Nelson area sometime. 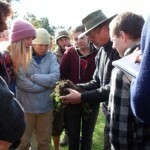 Like the idea of Edu WWOOF , prepared to support the development so keep in touch.